Hearing or reading about the state of the beleaguered labor market is impossible to avoid. The financial crisis began more than six years ago, and it has been even longer, since May 2008, from the last bottom in the unemployment rate (4.4%). In this piece, we take stock of the employment situation as it is right now, consider the trend it is following, estimate how long it may take to achieve full employment, and reflect on what may happen when we get there. If you just look at the headline non-farm payroll changes over the past two months (75k and 113k, a slowdown from 273k published in November), you could conclude that the labor market is slowing once again. Reality is more nuanced, and there is additional trouble in developing conclusions based on data that are highly revised multiple times up to a year after the initial publication (and long after most people actually care). Regardless, those are the data we have now, so let’s analyze the data at face value. There are in fact two measurements taken by the BLS (US Bureau of Labor Statistics) every month on the size and change in employment: the establishment survey, typically quoted as the “headline number,” which samples about 145,000 businesses per month about their employees, and the household survey, which samples about 60,000 households about their employment. BLS publishes a great guide to its methodology. The household survey (see Figure 1 above, red) has been more emphatic in the job growth picture than the establishment survey (blue). This is actually not abnormal. On a month-to-month basis, the correlation between both surveys is only 47%. The household survey is historically much more (37%) volatile, but over a full year, the two surveys converge with a correlation of 92% (see Figure 2 below). Perhaps most importantly, the household survey has led when the economy has been accelerating during an economic turning point in the past four recoveries (see Figure 3 below). 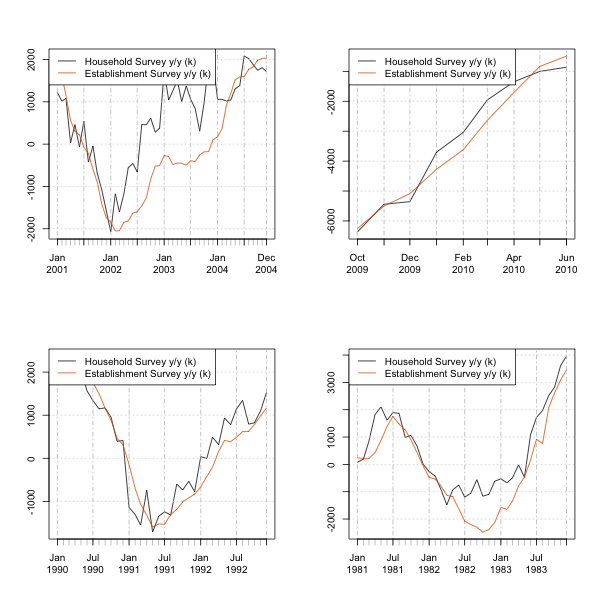 The establishment survey leads the household survey down before recessions, but the enormity of evidence against a downturn (leading indicators, fixed investment, asset prices) makes that explanation highly unlikely. It could thus be assumed that the establishment survey may play catch-up to the household survey. Although most of the focus on the employment situation is the headline numbers, unemployment rate and change in payrolls, it is composed of thousands of different series, covering employment, unemployment, race, age, gender, educational attainment, sectors/industries, hours, and pay. Change in these series that is not reflected in the headline numbers is often referred to as the internals of the report. They serve to tell us how the composition of the labor market is changing. The internals are consistent with the household survey, which has averaged 580k payrolls per month over the past three months. Starting with the most common criticism of employment data, the labor force actually grew by 523k, and the long-derided participation rate increased by 0.3%. The unemployment rate dropped across all education levels, but the most significant improvement happened for those holding high school diplomas, where the unemployment rate dropped a staggering –0.6% to 6.5%, an improvement bested only three times in the history of that series. Perhaps the biggest cause for optimism is the sharp drop in persons employed part-time for economic reasons. This category includes both “slack work or business conditions” as well as “could only find part-time work.” The number of people in this category dropped a staggering 514k. This improvement is in the top 96% of all readings going back to the series start in 1955. 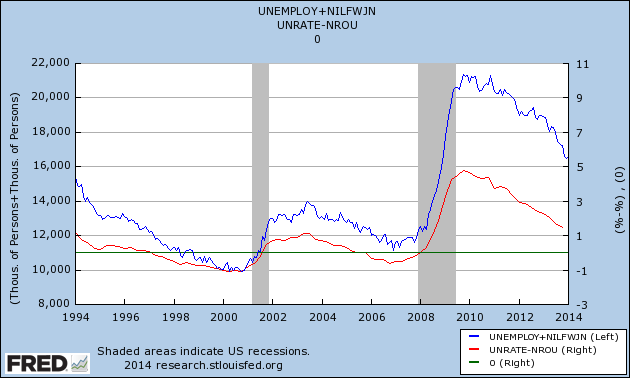 “U6,” the broadest measurement of unemployment and underemployment, dove 0.4% to 12.7%. All these numbers are subject to large month-to-month variation. What is clear is that the establishment survey payroll number is not consistent with much of the meat of the much broader Employment Situation report. The leading nature of the household survey in expansions provides some indication that the good news it contains will spread to the establishment survey. Is job growth keeping up with population growth? Although unemployment is above the natural rate, we need more than population growth to close the gap, and we are getting it. 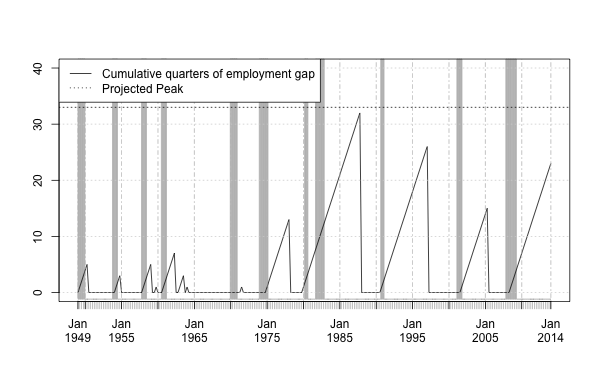 Once the gap is closed, however, the rate of job increases will be much smaller than it has been in the past purely on the basis of demographics. The natural rate of unemployment is typically defined as its theoretical level if the economy were running at full potential output. That doesn’t mean that there is no unemployment. Too little unemployment would mean inadequate liquidity in the labor markets, which would increase frictions to organizing people in jobs in the optimal manner for output. 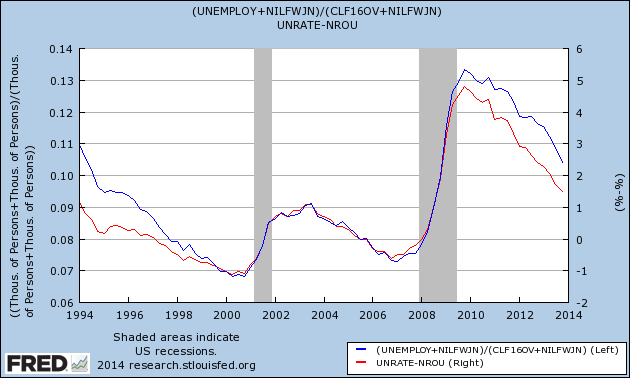 The sibling to the natural rate is the non-accelerating inflation rate of unemployment (NAIRU), which is the estimate of the lowest unemployment rate that would not be consistent with an accelerated rate of inflation. It seems likely at this juncture that the natural rate is lower than the non-accelerating rate. The consequence of this is that we could achieve higher real growth rates with higher inflation rates. The Committee reaffirmed its expectation that the current exceptionally low target range for the federal funds rate of 0 to 1/4 percent will be appropriate at least as long as the unemployment rate remains above 6-1/2 percent, inflation between one and two years ahead is projected to be no more than half a percentage point above the Committee’s 2 percent longer-run goal, and longer-term inflation expectations continue to be well anchored. 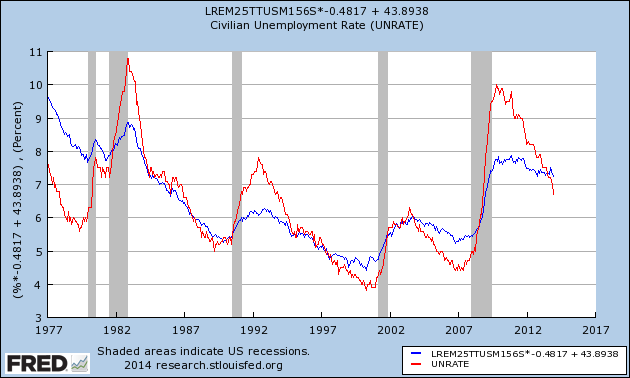 Using the last openings rate (2.8%), this leaves us with an estimated unemployment rate of 6.04% net of structural mismatch, which is 0.6% below the headline level. If structural unemployment is higher than estimated, employers will have to start raising wages sooner, and the marginal hire will be marginally less productive, leading to more accelerating inflation as the unemployment rate drops. With the Beveridge curve’s estimate, it’s possible to conclude that NAIRU may make the 80 bp gap between the actual unemployment rate closer than we suspect and that accelerating inflation may materialize in less than a year. At the current pace of 10 bps of improvement in the unemployment rate per month, it would take just eight months to reach the CBO’s 5.2% estimate. 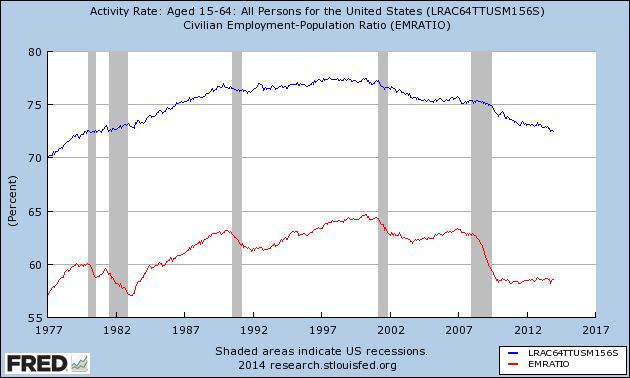 Why does the participation rate or employment-to-population ratio look so bad? Most everyone has seen a chart like Figure 7, illustrating the great decline in the participation or employment rate. It is true. But it is not a valid measurement of the labor market or unemployment. Both of these measurements embody the demography, culture, and shift in preferences. Children cannot work, young adults have attained increasingly higher levels of education, young women (predominantly) leave the workforce for rearing children, and the elderly retire. This demonstrates that the unemployment rate is largely consistent with the 25–54 participation rate and was in fact recently even higher than the activity rate would have suggested. The last time the labor market was considered at full employment (the unemployment rate was at the natural rate), the quantity of those unemployed and those not in the labor force who want a job now were roughly 13 million. 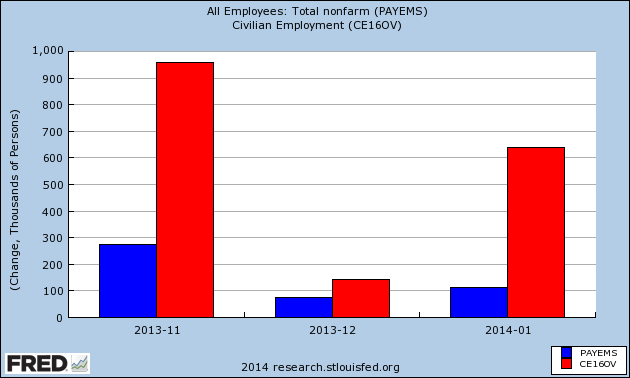 Full employment coincides with the “extended unemployment fraction” (Figure 10 above, blue) at 0.08, or 13 million. We henceforth use 13 million (Unemployed + Involuntarily not in labor force) as our estimate for full employment. Whether that is morally justified is a different discussion, but that rate would be consistent with the definition of full employment that is both historically consistent as well as likely acceptable by most of the political and social classes. The quantity is 16.59 million now, leaving a shortfall of 3.59 million jobs below full employment. Including a further 67k a month in natural labor force growth, with the rate of the past year’s payroll growth, gives us 2.5 years until full employment. If employment growth is closer to 250k, it falls closer to a year and a half. Policy has had a negative impact on employment. The federal government incurred large deficits but did not directly support the labor market. In fact, it contracted payrolls. 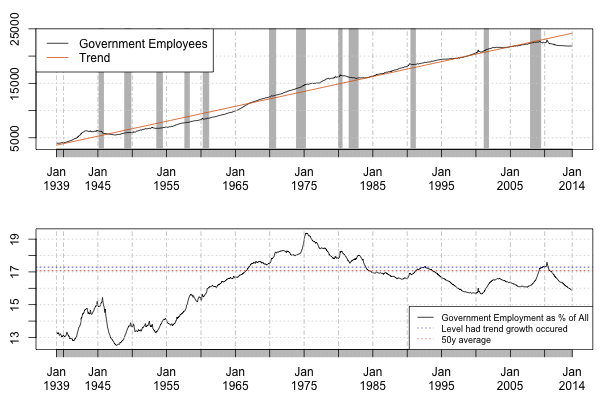 Had the growth of government payrolls simply grown at its historical rate (Figure 12) and all other things were equal, the employment gap would be just 1.2 million, or we would be just 10 months to full employment. Lest this lead to the conclusion that this would expand government employment at an outsized rate, this would have put the government payrolls as a percentage of employment almost exactly in line with the 50-year average of 17%. Fiscal policy isn’t the only thing that holds back employment. 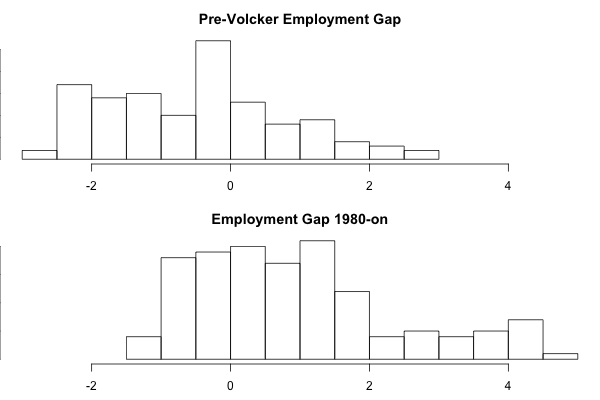 Although the Fed now has a zero interest rate policy and is engaging in quantitative easing, it has consistently traded lower inflation for higher unemployment starting with the Volcker chairmanship in 1979. Before 1980, it was abnormal to run below full employment. After, it has been abnormal to run at or above full employment. Using the pessimistic assumption of 2.5 years, the United States will have been below full employment for a total of 8.25 years (ending in mid-2016). Presently, this is the third longest duration the country has experienced a labor gap. The longest was the eight years between mid-1979 and early 1988. If the gap closes in the 2.5-year projection, it will narrowly become the longest in post-war history (Figure 11). Still, the labor market, including both the unemployed and those not in the work force but wanting jobs now, has approximately half recovered. In summary, this will likely be the longest period of time between full employment, narrowly edging out 1979–1988, but the labor market has substantially improved and full employment is solidly in sight. This is the best written economic paper that I have ever read. As expected the January jobs report is a significant disappointment to the voodoo economists – 113,000 actual vs 180,000 expected. This is the 4th dire jobs report in a row (from October to January). Over the last 4 months 423,000 jobs have been added, or an average of 106,000 per month. This is only 60% of the number of jobs that are needed to be created just to keep up with population growth. Real unemployment has gone up by around 257,000 over the last 4 months. The US labor market conditions continue to deteriorate. 2013 averaged 110,000 new jobs per month. This has jobs data going back to the end of 2007. For January there was very little difference between the Establishment and Household surveys. Establishment was +113,000, Household was +107,000. This is because the Establishment and Household surveys became so out of sync in 2013. There wasn’t a huge difference in 2012. The Establishment survey (used in the headline jobs numbers) dramatically over stated the numbers of jobs created in 2013 (by 1 million jobs). The vast majority of this difference was due to uncorrected errors in the BLS Birth/Death model for periods of slow economic growth. Official GDP growth in 2013 was 1.9% – stall speed. See also this on the deeply flawed Birth/Death model reporting. I will need to take account of the arbitrary addition of 509,000 jobs by the BLS for 2013 in the Household survey, in my future jobs number reporting. N.B. Some voodoo economists are trying to blame the weather for the poor numbers missing consensus by a large amount – this is total nonsense. The economists could of changed their forecasts a few days before the numbers came out, if they really thought the weather was going to affect the numbers. But they didn’t. 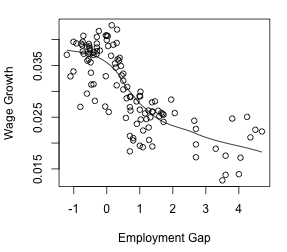 There is a very small positive correlation between more job creation and snow falling. The extreme cold and snowfall in abnormal places in January will, if anything, have created more work from, more car repairs due to accidents in the snow, repairing burst pipes, increased winter clothing sales etc. (it is unlikely to have made any appreciable difference to the jobs numbers). One of the planks near the top is wrong, I think. You mentioned that the idea that baby boomers are aging out the workforce implies that the number of new jobs needed to keep up with population growth could be less. That’s not really true. If you have more people retired/too injured to work, and fewer people working to support them, you’re increasing the dependency ratio, however valid and material that concept is. In my mind though, the changes in the level of support society gives–reduced pensions, 401k failures, means that workers with dependents are far more isolated and less supported than they used to be, and it was always relatively hard for someone to care for elderly parent (if not parked in a pre-mortuary, even that is expensive). Ultimately, saying that a benchmark (say 180k new jobs need to keep up) isn’t valid because the main growth is in non-working people strikes me as tenuous in the material world. 20 December 2013 What Happened to The Money Americans Borrowed Before the Crisis?